Jim Thorpe will join the world in prayers for peace during a candlelight vigil Tuesday, Nov. 24 at 6 p.m. in the Josiah White Park. Jim Thorpe author and spiritual activist Michelle Gallagher organized the bring-your-own-candle event after witnessing social media reaction to terrorist attacks and the Syrian refugee crisis. “Let’s create peace in the world by starting right where we are – on and offline. This is for our children,” Gallagher said. The bells of St. Mark’s Episcopal Church will ring to open the ceremony which will include poetry, music and the ringing of Tibetan bells to raise and carry the vibration of peace around the world. Those unable to attend the actual event are encouraged, wherever they may be, to light a candle and offer their own thoughts and prayers for peace. The warm glow of Christmas Past beckons you to the 34th Annual Olde Time Christmas Festival in Jim Thorpe, PA, celebrated the first two weekends in December – December 4, 5 & 6, 12 & 13. The tree lighting celebration at Josiah White Park (train station) kicks off the festivities on Friday, December 4 beginning at 5 p.m. with music, caroling and dancing. Santa will arrive by firetruck at 6 p.m. to light the Jim Thorpe Christmas tree donated by Beisel’s Christmas Tree Hill in Lehighton. Throughout Olde Time Christmas, goers will enjoy train rides with Santa, a gingerbread house display and children’s story time at the Dimmick Memorial Library, 54 Broadway, the 8th annual display of more than 500 crèches from around the world (Dec. 5 & 6) at St. John Lutheran Church, 319 South Avenue, holiday shows and concerts at the Mauch Chunk Opera House, 14 W. Broadway, and shopping Jim Thorpe’s 35 unique shops and galleries for that perfect gift. A visit to the Gilded Cupid, 40 Broadway, will take folks back in time with a German old-world themed tree display on Saturdays, December 5 and 12, from 12:30 p.m. to 5 p.m. Fireside stories for children will be presented at 2 p.m. on both days. F. Hiatt’s fireside stories for adults only are also back by popular demand at 9 p.m. on both Saturdays. Reservations are required. Refreshments will be served. $10. A portion of donations from the afternoon and evening events will benefit the Wounded Warrior Project. 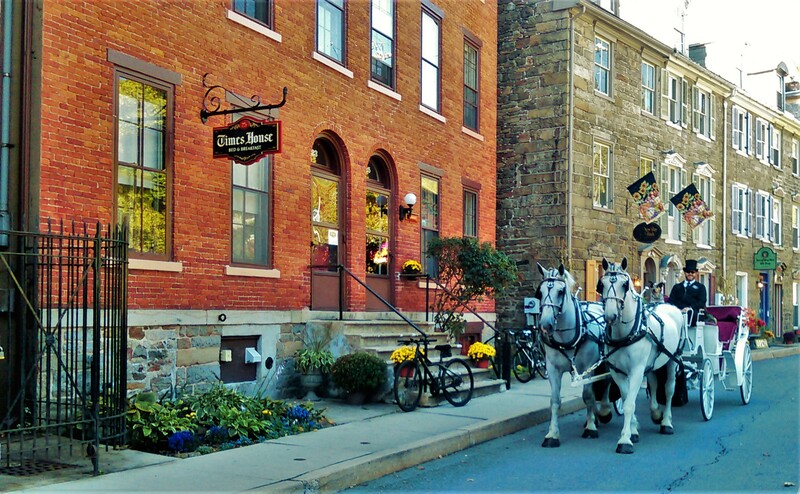 On the dark side of the mountain, Race Street in Jim Thorpe is a magical place. Here at the bottom of the valley of Old Mauch Chunk in front of the Stone Row and the old church, residents and shopkeepers will gather with brooms in hand to sweep cobwebs out and magic in. The event will begin in the Stone Row Gallery, 29 Race Street, with an exhibition of ghost photography . The work is by Kevin Yee, whose Victorian Cabinet Card Creations have been attracting the attention of serious collectors. 5:00 p.m. – Pennsylvania writer Colleen Davis will read her most recent short-short story, ” 31 Days of Ghosts.” Christian Gould will perform Edgar Allan Poe’s much-loved ‘The Raven ” in period dress. 6:30 p.m. – The sweeping ritual will begin. 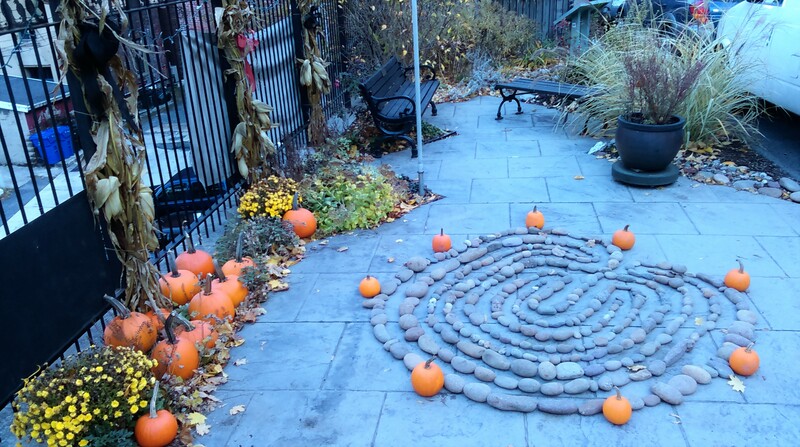 We welcome visitors to historic Race Street and ask they bring along their brooms, and even their Masks, and Capes to join us in circling the spiral Labyrinth in the Race Street Park..
Refreshments appropriate to the occasion will be served from antique cauldrons on the Etching press in the gallery. Banners and colorful mums welcome visitors to the Times House B&B and historic Race Street. On Penn Live’s Bucket List of 28 Things to Do in PA Before You Die, Jim Thorpe’s Fall Foliage Festival Weekends are here! In addition to free live music throughout the historic district, there are some great shows lined up this weekend at the Mauch Chunk Opera House. Tonight Ted Vigil will put on an incredible John Denver tribute concert. Showtime: 8 p.m.; tickets – $26. Damn the Torpedoes will rock the house Saturday night. The third visit to the venerable ol’ opera house for the group, the Tom Petty tribute band’s front man Rich Kubicz does Petty better than Petty does Petty, according to some. Showtime: 8 p.m.; tickets – $20. Check out video from May’s performance. Take in the architecture and splendor of days gone by this Sunday when the Mauch Chunk Museum and Cultural Center is excited to present its Victorian Home and Garden Tour from Noon to 5 p.m. The self-guided tour of 20 Victorian homes and gardens will offer goers a rare glimpse inside Jim Thorpe’s 19th century homes including the magnificently restored Dimmick House, the Convent home on West Broadway, the Stone Row home at Three Mountains Gallery on historic Race Street, as well as magical secret gardens such as the Friends of the Library hidden pollinator garden on Broadway. Several private homes have never been open to the public in the past. The Mauch Chunk Museum and Cultural Center at 41 West Broadway in Jim Thorpe is sponsoring the fall tour to help further its mission of preserving and presenting historical artifacts, personal treasures and experiences of those who lived and worked in the anthracite coal region from the early 1800s to the present time. The Museum is open daily from 11 a.m. to 5 p.m. Memorial Day through October 31; weekends November and December; by appointment January through May. Same day tickets may be purchased at the Mauch Chunk Museum and Cultural Center, 41 West Broadway, Josiah White Plaza at the Train Station in Jim Thorpe, and Friends of the Library 58 Broadway. $20 adults; $10 children. Rain or Shine.